This page will offer fine vitreous china to ceramic stoneware. We buy all kinds of dinnerware in our travels and sometimes have only one nice piece to offer or complete sets, serving eight to eighteen or more. We can't put every piece on this page so if you are looking for something special or trying to replace broken pieces send us a photo and we can look. Check our Site Map for Jewel Tea Co. Autumn Leaf pattern by Hall China and other collectable glass or antiques. This beautiful china set consists of 79 pieces, service for 8 plus extra pieces (only 7 perfect cake plates, plus one with age crack). Serving pieces include a large, 16 1/4" platter (visible chip) a 12" serving platter, one 10 1/2" oval serving bowl, 11" round bowl with handles and cover, gravy boat with attached platter and a sugar bowl with lid. The only piece missing from the set is the creamer and all pieces are in perfect condition except as noted. This set was purchased in Japan in 1952 by an American GI. 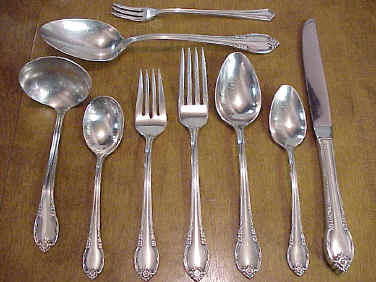 This beautiful set valued at $1600.00 is offered at only ... $998.00... BUY NOW See other place setting photos below. This beautiful pattern is pink dogwood with gray and brown leaves set on a white back ground with gold trim. The dinner plate measures 10 3/8", the luncheon plate 8 1/2", the flat soup 7 3/4", fruit 5 3/4", a cake plate is 6 1/2", saucer 6" and cup 4" in diameter. This setting photo shows the band of taupe and gray leaves that encircles the 10 1/2" dinner plate, cup and saucer and all the rest of the pieces. The platinum border is very crisp on all pieces. This is a fine set of service for six in excellent condition except for the two small noted chips. The FENTON amber candy dish with handle has a scalloped rim and base. It is 6 1/4" high and 7 1/4" wide with handle. The bottom is smooth ground and makes a great accent to any table. We have it priced at $45.00 ...BUY NOW. Use your own colorful accents to contrast with this lovely and delicate service. Sets such as these were commonplace with the ladies of leisure but are getting as scarce as time itself. Reward yourself with a gift of time and needed pleasure. Accent pieces and tableware can be found elsewhere on this page or go to Antiques. Shipping and insurance is generally only about $9.00 or $10.00 to bring these fine collectable and useful items to you. 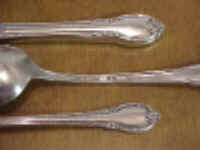 This is the place setting of the flatware that accents the above Marmalade Dinner Set. It consists of five pieces. The condition of these is not good, most seem to have been washed in dishwasher one too many times. See the thumbnail for an idea of what pieces are generally usable. We bought these on the internet in a group that was listed as mint. Believe me they are not. But, we have accumulated these and now have a total of 32 pieces of which 8 are dinner forks, 7 salad forks, 5 knives, 5 teaspoons and 7 tablespoons. We want to sell the lot, you can use a few with your other good ones, the rest in a pinch. Libby Glass Company made several different styles of glasses in the Marmalade Pattern to accent the set for International China. We have two sets of 4 each of the double old fashioned glasses measuring 3 1/2" tall. they are in mint condition and we have them priced at .... $30.00 per set ... BUY NOW. This is a lovely set of Bohemian China, made in Czechoslovakia, circa 1970, includes 98 pieces. The pattern name is Maria and consists of a floral bouquet centered by an open pink rose. The bouquet also has pink and gray accents of leaves and flowers. Encircling this on the border of the plates, are four smaller bouquets of similar design with a small, single rose between. All pieces have a ruffled edge with gold band. This is a large, complete service for 12 and consists of 10 1/2" dinner plates, 7 5/8" salad plates, 6 3/4" bread plates, 8 3/4" flat soups, 5 1/2" fruit, 5 3/4" saucer with 3 7/8" wide x 2 1/2" high cups. The cups have a shallow, scalloped foot. Included also are three extra cups (1 with a tiny chip) and three extra saucers. To accent the set there are two, 9 1/4" round vegetable bowls, a 13 1/2" oval platter, a 12" round platter, an 8" gravy boat with attached platter also creamer and sugar with lid. The entire set is in mint condition. The reverse is marked "Fine Bohemian China - Made in Czechoslovakia" and "Maria." ... Packing for shipment will be $30. plus actual shipping charges and insurance because of the size. This lovely set has a value of about $2400.00 and we have this elegant dining group priced at just $1100.00. ... BUY NOW. 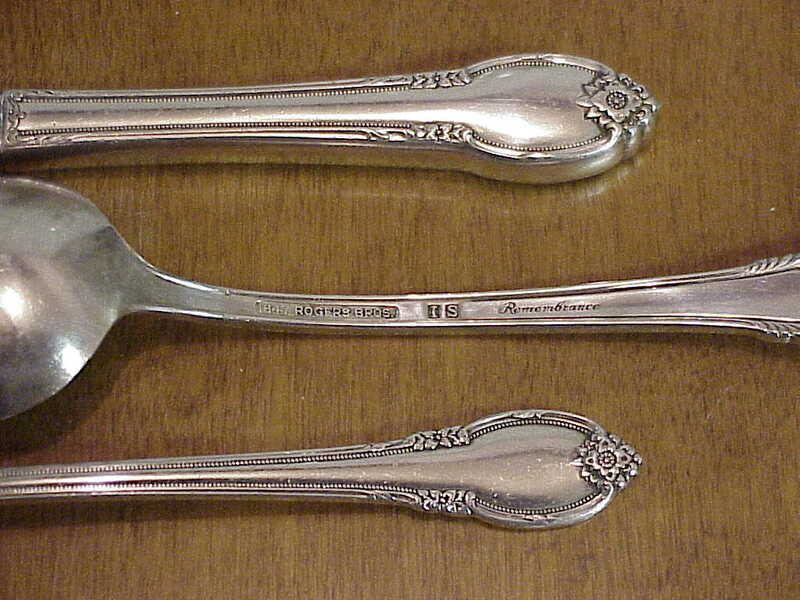 These cream soups are Spode from Copeland, England as show by the markings in the thumbnail. They measure 4 3/4" across without handles and 6 5/8" with. They are both in mint condition with a finely scalloped edge, a lovely country scene on the interior and are a lemon yellow on the outside. BUY NOW ... $25.00 for the pair. The Robinson Ransbottom Pottery Company is the oldest continuing stoneware factory in the country. We did a tour of the factory several years ago and it was extremely interesting. We saw the process of making these pieces from start to finish. They have the look and feel of pieces from an earlier time and will grace any kitchen. UPDATE: THE ROBINSON RANSBOTTOM POTTERY COMPANY HAS CLOSED ITS DOORS. We were in the area in June of 2008 and were going to pay another visit to their factory only to find out it no longer exists. Pictured at the top are four, 16 oz. tumblers, they are 5 1/2" tall and 3" across. We sell these individually at $9.00 ...Buy Now.